Next morning, I met up with my friend Dani, and just a little sleep deprived, we set off for the reservoir to sail. I’m not an expert sailer but I know the basics and Dani has done it a couple times herself. Besides, we figured that the best way to learn is to just throw ourselves into the water and see what happens! We arrived at the sailing club at 9AM, before anyone else. I picked out an orange boat, and we sipped on some Sprites while the caretaker set up our watercraft for us. While waiting, I noticed Dani was wearing a very fashionable back hat, with “Zambia” written on the side in silver letters. She told me it was her favorite thing she got on a mission trip from 4 years ago. The caretaker came up to us, and told us our boat was ready to sail right as more club members started to arrive. One fellow, a lean 65 year old from the UK named Robin, shook our hands and asked us a mess of nautical questions that I did my best to answer. After the interrogation, I felt a little uncertain of our impending sailing experiment. Maybe I wasn’t as prepared to sail as I thought. But the boat was ready, and so were my over-confident tendencies. Dani and I walked to the banks of the reservoir. Dani got in first, and I second. As the caretaker pushed us off to sea, he yelled two things: “please be careful today, the hippo might be nearby” and “you need to untie the rope!” I untied the rope while Dani asked, “wait, what do we do if we see the hippo?” He advised to just stay in the middle of the reservoir, because hippos don’t like deep water. I asked Dani to insert the daggerboard, while I gave a very convincing show that I was beginning to understand the various ropes and steering mechanisms. Fortunately, there was not a single breath of wind that morning. So I had ample time to mess around, while the orange boat lazily floated away from shore. The day was clear, and the sea was glass. There were naked village children yelling “Azungu” (white person) from the shore. Dani and I remarked on the pleasant weather, and continued to converse until a small, sustained, gust pressed up against us. I grabbed a rope, directed the rudder, and felt accomplished that I was now successfully captaining a sailing vessel! The wind picked up and the boat leaned to the right (starboard side). I could tell Dani was beginning to feel a little uncomfortable about the boat tipping. When the wind died down, I explained to her that it’s literally impossible for this boat to flip. “Oh, really?” she said. Her eyebrows lifted signifying that I had reassured her. I was proud of myself for calming her nerves. For about 5 seconds. All of a sudden a huge gust of wind came without warning. It spun the boat 90 degrees, and leaned the boat into the water so much so that Dani fell out and water came gushing in. The wind continued to howl around the lopsided boat while I tried my best to hold on. But it was all for nought (pun intended!) The boat completely tipped over, upside down, and I went with it. Dani and I were now in the water, next to our upside down boat, whose sail was pointing perfectly downward. In nautical terms, we were “turtled.” Seeing us capsize caused the village kids to roar with excitement from shore. “Azungu! Azungu!” they shouted. When they weren’t shouting, they were laughing. I grabbed onto a ledge and hoisted myself onto the top (or bottom) of the boat. I then helped Dani up. The two of us were now sitting criss-cross-applesauce on the top of our upside down boat. We wondered when people would come help us. It was a good 5 minutes before there was any on shore indication that they were sending a rescue team. Finally, two white guys in a canoe started paddling, and next to them was a another white guy swimming. As they approached, we took stock of everything that had gone missing. I lost my sandals, and Dani lost her sunglasses, black Zambia hat, and sunscreen. The guys in the canoe arrived first, and they immediately wandered off to collect our floating belongings. Then the swimmer arrived. It was Robin, the elderly gentleman we had met earlier. He diagnosed that the sail had fallen off, so the two of us pulled it out of the water to hand to the canoers. While doing so, they informed us that the only items found were some pieces of wood and my sandals. I looked over at my first mate and said, “Dani, I’m so sorry that we lost your hat.” I felt terrible. We all introduced ourselves to each other out there on the water, and then began strategizing on how to get back to shore. During this conversation, 2 gentlemen who worked at the sailing club glided up to us in a rowboat. The canoers agreed to take back most of the items, Robin decided he was going to flip the boat back over, and the row-boatmen decided they were going to tow us back into shore. Then, without explanation, I anxiously dove back into the water. Everyone stopped talking, and gave me a puzzled look. I swam out a few yards, turned around, swam back, and then tossed Dani’s black hat up onto the boat. I felt as though the entire day had been reconciled. We proceeded with our plan, and safely arrived back on shore. Dani and I discussed the possibility of giving sailing another try, but those inclinations were swiftly crushed. We heard people yelling, “look, it’s right over there where those people were!” The village kids were again blown up with excitement. Dani and I perched our necks to see what the bustle was about. 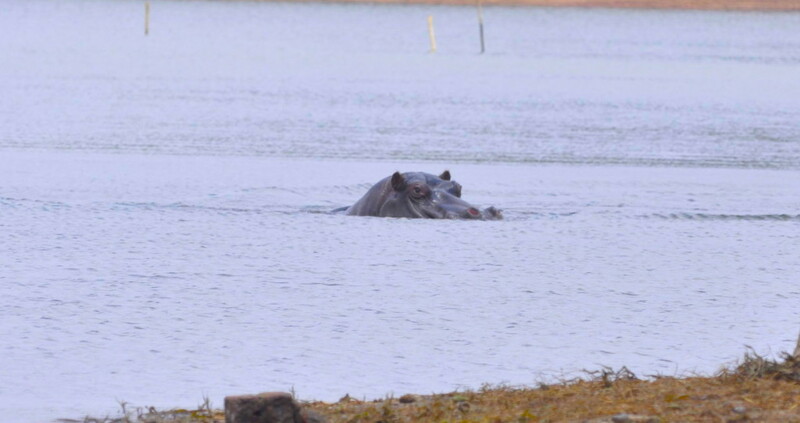 Out there in the reservoir, right near to where we had capsized, a hippo’s angry head emerged. The kids were throwing stones at it, and in agitation, the hippo splashed around by diving in and out of the water. “Good to know” I thought. Hippos are actually the most deadly animal in Africa. They kill more humans than lions, elephants, hyenas, or anything else. Had our boat capsized 20 minutes later, the spill would have been a much more terrifying experience. Thank God for His protection. We took a few pictures, and arrived home by 12:30PM. This entry was posted in Malawi on October 23, 2013 by Gret Glyer.